The Republican debates—21 so far this presidential primary season—have captured the attention of Americans. As the New York Times reported on October 16, the television audience for these intense verbal clashes has been record-breaking, nearly doubling the ratings for the 2008 primary debates. While the candidates spar on the public stage, Chicago Public Schools students participate in their own, intense debates through the Chicago Debate League, a joint program run by CPS and its nonprofit partner, the Chicago Debate Commission. Nearly 1,500 students—most of them low-income students of color—are debating this year through the League. The students’ contests are characterized by evidence-based argumentation, detailed policy analysis and direct refutation of their opponents’ policy positions. To prepare, debaters spend an average of 440 hours of out-of-school time researching and reading source materials to gather evidence, using the evidence to develop cases and rebuttals, and building argumentation skills. Their topics are complex. This year, students are debating topics in U.S. space policy. Next year, they’ll debate transportation infrastructure issues. Other recent topics have included military policy, poverty and the economy. The interest in debate in the political sphere parallels an emerging interest within the education reform community in the very components that define competitive policy debate as practiced in the League—making arguments, engaging with other arguments, and using evidence. Education experts increasingly acknowledge that these skills have substantial academic value, and that participating in debate motivates students to develop these academic skills. The education reform community’s recognition that the essential elements of academic debate should be made central throughout K-12 education is welcome news to leaders of academic debate in Chicago. 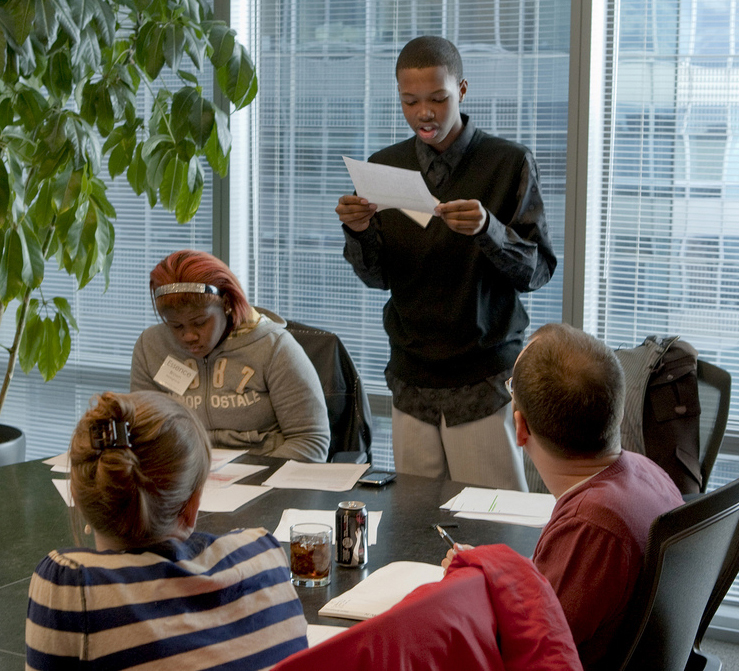 Since its inception in 1997, the Chicago Debate Commission has placed argument, engaging other views, and using and analyzing textual evidence at the center of our education reform project. These results should inspire our city’s education leaders to replicate, expand, and indeed take to scale, the current competitive academic debate programming of the Chicago Debate League. But CPS could achieve even wider transformative results by incorporating many of the elements of academic debate into K-12 classrooms as part of the curricular redesign efforts currently underway to prepare CPS schools for the system-wide implementation of the Common Core. In this approach, often called Curricular Debate, students in core subject areas (English, social science, science and even math) engage each other in evidence-based argumentation exercises in a wide range of formats. Curricular Debate is not simply aligned with the Common Core. It provides a direct route to moving students toward achieving the standards. Take as an example Reading Standard #1: “Read closely to determine what the text says explicitly and make logical inferences from it; cite specific textual evidence when writing or speaking to support conclusions drawn from the text.” In Curricular Debate units, students learn to determine what a text says, to summarize the ideas and information, to locate its main arguments and distinguish them from subordinate ones, and to support or question statements in the text while citing the text explicitly and accurately. Speaking & Listening Standard #4 provides another apt example: “Present information, evidence, and reasoning in a clear and well-structured way appropriate to purpose and audience.” In Curricular Debate units, students learn to present information clearly and persuasively. They learn how to find information, assess and evaluate evidence and structure their analysis in the form of direct argument. Efforts to infuse debate into the curriculum have been underway for about five years in Chicago—with small projects pursued by the Chicago Debate Commission, and dozens of teachers from various schools conducting classroom debating units. But now may be exactly the right time to coordinate these efforts and bring them to scale as cohesive, integrated parts of the regular Common Core aligned classroom curriculum. The Chicago Debate Commission has developed an approach to bring the tools of debate into the classroom, leveraging a sterling track record in its work with competitive debate. We believe that wise and forward-thinking administrators will see the benefits of using debate skills as an efficient and engaging vehicle to help move teaching and learning in our public schools toward the Common Core. In short, then, the goal of teaching students the skills they need for college and life success makes a strong case for expanding one of Chicago’s most performance-proven education programs. We urge CPS both to expand its support for the current competitive academic debate programming and to incorporate Curricular Debate in the curricular redesign efforts currently underway. With resources dedicated to teaching the powerful skills of debate, CPS will be better positioned to become a national leader in successfully implementing the Common Core. Les Lynn is the founding director of the Chicago Debate League and of the National Association for Urban Debate Leagues. He is now the Director of Programming of the Chicago Debate Commission. Edie Canter is the Executive Director of the Chicago Debate Commission. Previously she was the Director of Development and Communications for Leadership Greater Chicago. Anxiety and skepticism over whether all CPS schools will administer the new state-mandated PARCC test reached new heights this week as principals and teachers reported the delivery of boxes of tests to their buildings. “I’m trying to diffuse that [anxiety],” said Heather Yutzy, principal at Belding Elementary in Irving Park.